Kansas City Family Dentist, Timothy T. Taylor, D.D.S. When you visit our office, your smile is our top priority. Our entire team is dedicated to providing you with the personalized, gentle care that you deserve. Dr. Timothy T. Taylor is pleased to serve patients throughout the great Kansas City area, including KS metropolitan area, Wyandotte, Johnson & Leavenworth counties. He is known locally as "Tim the Tooth Man". Your smile is our first priority, and we’ll give you something to smile about and Dr. Timothy Taylor understands that not all smiles were born that way. This is why Dr. Taylor has had advanced training in dental implants, porcelain veneers and other cosmetic and restorative techniques. 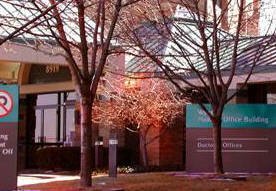 We are conviently located in the Wyandot Medical Building. Our front office Staff looks forward to welcoming you to our practice. Kansas City Dentist, Dr. Timothy Taylor is a professional dedicated to Excellence in General, Family, & Cosmetic Dentistry such as Dental Implants, Cleanings & Prevention, Restorations, Periodontal Disease & many other dental procedures. Please come and visit Kansas City Dentist, Dr. Timothy Taylor.